Taurasi added 28 points (9-19 FG, 4-9 3Pt, 6-8 FT), eight assists and six rebounds in the 91-87 playoff loss at Seattle on Tuesday. Taurasi was firing away from all aspects of the floor Tuesday and reached the 28-point mark on 47.4 percent shooting while also dishing out a team-leading eight assists in the loss. So far this postseason, the former UConn Husky has scored safely past the 25-point plateau in each of the four playoff games. Taurasi posted 25 points (8-17 FG, 4-10 3Pt, 5-5 FT), eight rebounds and six assists in the Mercury's 91-87 playoff loss at Seattle on Sunday. Despite turning the ball over six times, Taurasi finished with a superb outing as she dropped 25 points on 47.1 percent shooting while dishing out a team-leading six assists. So far this postseason, the former WNBA MVP is averaging 26.0 points and 7.7 assists over three playoff games. Taurasi finished with 26 points (8-15 FG, 6-12 3Pt, 4-4 FT), 12 assists and two steals during the 101-83 playoff victory over visiting Dallas on Tuesday. Taurasi totaled yet another double-digit assist performance, as she dished out a team-leading 12 assists Tuesday while also dropping 26 points to mark the third double-double in her last four games. Taurasi will look to keep things rolling as the Mercury travel to Connecticut on Thursday in the second round of the 2018 WNBA Playoffs. Taurasi tallied 27 points (6-18 FG, 4-13 3Pt, 11-12 FT), 14 assists, four rebounds and two steals across 34 minutes during Friday's 104-95 victory over the Dream. Taurasi, who set a career-high 14 assists on Sunday, managed to reach that total again Friday. She also dropped at least 20 points, four rebounds and two steals for the second straight contest. She's in the midst of her best scoring season (20.6 PPG) since 2011, and her best passing season (5.1 APG) since 2014. Taurasi finished Sunday's 86-78 win over the Sparks with 20 points (6-9 FG, 2-5 3Pt, 6-6 FT), a career-high 14 assists, five rebounds and two steals across 38 minutes. Though on the tail end of her career at 36 years old, Taurasi continues to add to her long list of milestones in what has been a resurgent campaign. Through 31 games, Taurasi is averaging 20.6 points per game -- her best mark since the 2011 season -- while shooting 45.3 percent from the floor, 38.4 percent from distance and 92.4 percent from the charity stripe, all of which are well above her career rates. Taurasi finished with 29 points (9-21 FG, 3-12 3Pt, 8-9 FT), seven abounds, five assists and one block in the 103-98 home loss to the Mystics on Tuesday. Despite going three-of-12 from deep, Taurasi totaled 29 points in the loss Tuesday mainly by shooting 66.7 percent from inside the arc and going eight-of-nine at free-throw line. Over 29 appearances this year, the 26-year-old veteran is so far averaging 20.9 points, 4.8 assists and 3.4 rebounds per outing. 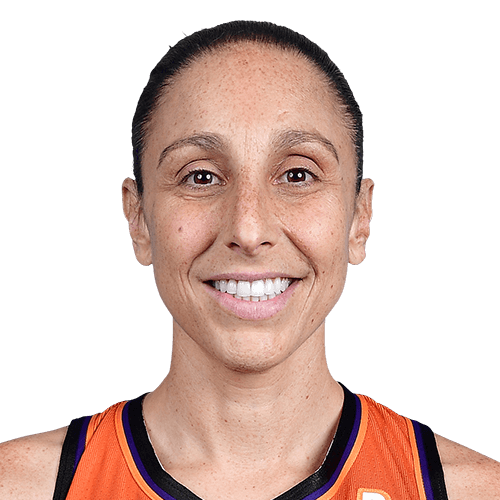 Taurasi registered a season-high 37 points (8-17 FG, 4-10 3Pt, 17-18 FT) to go with nine assists and four rebounds across 34 minutes Wednesday in the Mercury's 104-93 win over the Aces. Between her own scoring total and the buckets that came from her assists, Taurasi was responsible for 58 points on the night, matching the Wings' Liz Cambage for the WNBA season high. Though nearing the tail end of her career at 36 years old, Taurasi remains as productive as ever. She's averaging 20.9 points per game -- her most since 2011 -- while shooting efficiently from the floor (45 percent), three-point range (39.6 percent) and the charity stripe (a career-best 93.3 percent). Taurasi amassed 20 poins (7-15 FG, 2-6 3Pt, 4-5 FT), five assists, four rebounds and two steals in Tuesday's 102-91 loss to the Storm. With the All-Star break and missing the previous game due to suspension, Taurasi had a 10-day absence before putting up 20 points and five dimes in the loss Tuesday. Through 26 games played this year, the three-time WNBA Champion is averaging 20.3 points per outing which is her highest since the 2013 season. Taurasi served her one-game suspension during Wednesday's game against Chicago. Taurasi's availability for the All-Star Game was never in question, but she did receive a one-game ban after picking up her seventh technical foul of the season in Saturday's loss to the Lynx. The future-Hall-of-Famer will play in the All-Star Game in Minneapolis on Saturday and is expected to be available for the Mercury's next game Tuesday versus Seattle. Taurasi has been dealt a one-game suspension and will sit out Wednesday's game against Chicago, Andrew Joe Potter of The Score reports. Taurasi received her seventh technical foul the last time she took the court, which draws an immediate one-game suspension from the league. Look for her to sit out Wednesday's contest, but she should then return to the lineup ahead of next Tuesday's tilt with Seattle. With Taurasi sidelined, the likes of Briann January and Yvonne Turner could be in line for added minutes in the backcourt. Scored 10 or more points in a franchise-record 50 consecutive games from July 1, 2009 – Aug. 13, 2010. Played in just eight games (4-4 Mercury record), the fewest of her nine-year WNBA career… Had never played fewer than 31 games in her previous eight seasons. July 11: Named “Best WNBA Player” at the 2012 ESPYs, her third straight ESPY in that category and sixth career ESPY award. Others: “Best Female College Athlete” (2003 and 2004) and “Best Female Athlete” (2004). July 28: Recorded the 1,000th assist of her career… Became just the second player in WNBA history with 5,000 career points, 1,000 rebounds and 1,000 assists (Katie Smith). July 15: Became the fifth player in WNBA history to score 5,000 career points… quickest to do so in just 243 games. July 13: Won ESPY for Best WNBA Player for the second straight year… her fifth career ESPY. Spent 2011-12 offseason playing for Galatasaray in Istanbul, Turkey where she led the league in scoring with 20.9 points per game.